Plot: Star Wars fans travel to Skywalker Ranch to steal an early copy of Star Wars: Episode I – The Phantom Menace (1999). Who tracks down Han Solo and takes him to Jabba The Hutt in Star Wars Episode V – The Empire Strikes Back? At the end of Star Wars Episode VI – Return Of The Jedi, which ghosts can Luke see? If you did not get all three of them right, Fanboys is not a movie for you. Unless you want to see Kristen Bell in a Princess Leia costume. Fanboys is a classic “teens roadtrip” movie where they encounter different obstacles a long their way to break into George Lucas’ Skywalker Ranch and watch a Star Wars movie, about to be released a few months later. Did I mention Kristen Bell in a Princess Leia costume? Or if you must see Kristen Bell in that Princess Leia costume! 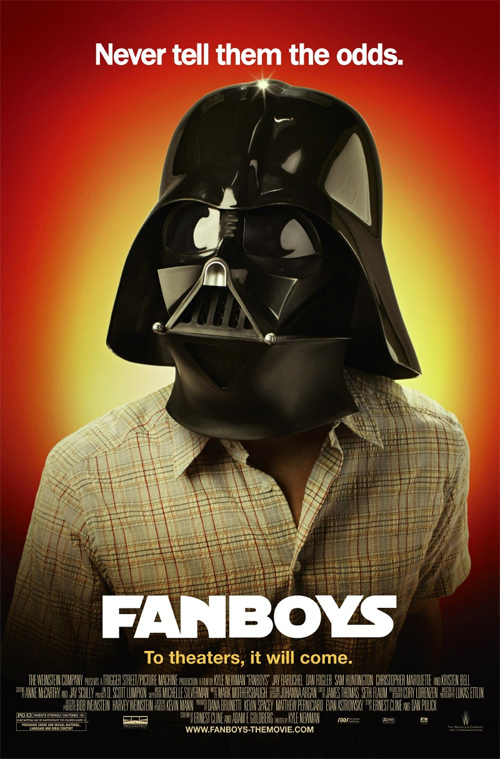 Have you seen Fanboys yet or do you plan to rent it anytime soon? Ha – glad you gave us those three questions – I don’t think this movie is for me. I don’t even think seeing Kristen Bell in the Princess Leia costume would do much for me. 😀 I’m staying tuned to your movie reviews though – I appreciate having the reviews instead of just trying to tell by the cover whether I’d like one or not. Not sure how I hadn’t heard of this one. My wife laughs at my geekiness, so I may have to add this to my Netflix queue. .-= Evan´s last blog ..5 Tech Sites Every Geek Should Visit =-. I’ve heard about this movie – it’s something I’ve been wanting to see now for ages!! Otherwise, you’d just have to kick back alone with “Fanboys”.